A couple of weeks ago the subject of world events came up on the official forums and drew enough attention to garner a dev response. The original poster pretty much asked for most events to be on all the time because "what does it matter", and to my great bafflement the dev response was that this sounded like a good idea. If an event is always on, it ceases to be an event and becomes just another daily area or whatever content the "event" previously consisted of! Limited availability is part of the appeal. Thinking about it some more however, this does seem like a natural evolution of the attitude many MMO players have displayed towards limited-time events for years. At first they were completely unique, once-in-a-lifetime occasions. I thought these were fun! But people complained if they happened to fall on a week when they were on holiday, and the devs were accused of "wasting time" on things that were only temporary. So we got events that were designed to be repeatable instead, though there was still a certain sense of mystery because the length of time between different iterations was initially unknown. Again, people complained that it took too long to get the rewards they wanted and that they couldn't make plans to continue working on a reputation or quest chain they wanted to complete. This led to things being put on a semi-regular schedule, which got quite boring. So now people complain that there's no point in having events at all. 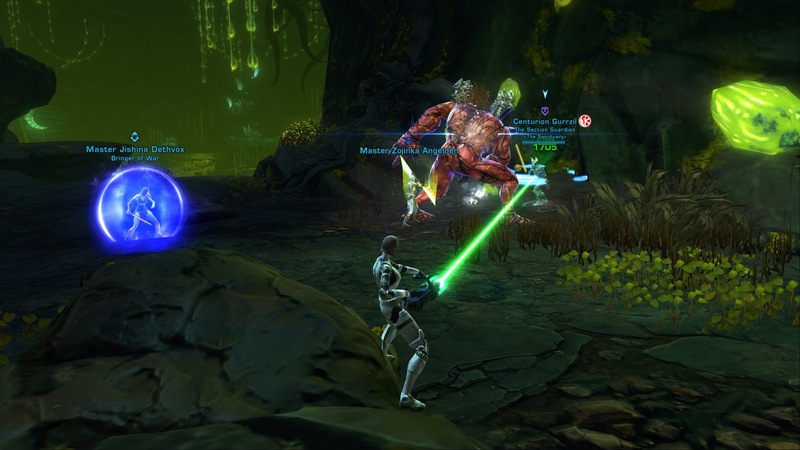 I will admit though, that for someone who does like events, including their limited availability, I haven't actually participated in any of SWTOR's in quite a while, exempting the occasional Xenoanalyst kill maybe. Being as into the game as I am, I always jumped in feet first when a new event was first introduced and did all the things, every day and on multiple alts. Remember that time I got all the Bounty Contract Week achievements in the first week? By the second or third time I might still go back to finish off a stray achievement or something, but after that I mostly stopped caring, especially as Bioware has rarely added new content to events like these, only more rewards you can buy from a vendor if you are so inclined (which I rarely am). Something recently gave me a reason to give them another look though: my alts on Star Forge. (Yes, there is a second one now!) With their fledgling legacy and virtually no achievements, I find myself able to view everything with fresh eyes - not quite like a new player of course, but from a different perspective. It's one thing to know that this is the oldest repeating world event in the game, but it's another to really take in the fact that it was introduced back in 2012. That's a long time to do all the things and get bored. Ironically, I'm still lacking a bunch of the achievements on my main server, simply because most of my interactions with the event took place before the achievement system was actually introduced. The overall logic of the zone has suffered from the introduction of PvP instances though. The southern half of the ice shelf, which used to be the dedicated PvP zone, feels a bit pointless now and basically just prevents you from summoning a companion for no reason. Doing the heroic mission down there was originally designed to be a bit easier to make up for the risk you took by flagging for PvP, but nowadays it's just easier to go there, period (assuming you weren't planning to summon any companions to help you out). Unlike for example the quest to find the Outlaw's Den that you get from the terminal on the fleet, the old Gree PvP missions have also been adjusted so that they actually require you to enter a PvP instance to complete them. I did so once just to see what it was like and got killed twice (not much hope for a lonely healer in greens). Nobody was spawn-camping people near the objectives though, so I got things done quickly enough, but I certainly had no urge to come back for more. I wasn't too fussed about Xenoanalyst since it took me a few days to earn the required reputation to enter the Gray Secant anyway, but I was still a bit sad to not see any ops groups forming in general chat all week. This might have been down to me playing at off-peak hours for the server though. Also, when I went to look for the world bosses in the caves, there was no trace of either of them, so I guess someone must have been busy killing them. This felt like the event that had changed the least, though the trip around the houses to complete each henchman or kingpin mission has been shortened fractionally by not having to go to your ship anymore to fly to different planets. I was just a bit put off by just how easy all the bosses have become. The kingpins used to be a piece of work for two people back in the day but now die easily, and the henchmen die so easily that it's actually really hard to capture them alive! You basically have to set your companion to passive in time and prod them very, very carefully or they'll fall over dead before you've even realised what's happening. The only thing that really surprised me was one time when I interrogated a shady character and he became hostile, after dying he did not drop a piece of intel! He only had a grey item called "corrupted piece of intel" or something like that. I never knew that could even happen! I swear in all my grinding out of the achievements I had never seen that before. Vayne Verso from Twitter drew my attention to this one by complaining that it didn't feature level sync. I was like "What, really?!" and felt inspired to go look for myself. And he was right. For some reason the rakghoul tunnels have been immune to the spread of level sync everywhere else in the world, which is kind of ironic considering that the Eyeless was the game's first ops boss that allowed low-level players to participate by scaling them up (as far as I remember). It's not a big deal in the sense that you can still do most of the dailies and the weekly, using the same system that was originally designed to make the event accessible to people of all levels (by having low level mobs around that spawn reinforcements of the appropriate level as soon as you hit them). But getting a group for the heroic as a lowbie is pretty impossible, as the mobs scale to the highest level in the group and you'll be pretty useless. Plus things like accidentally aggroing another person's mob can kill you. Both of those things were annoying but tolerable back in the day, but in 2018 there's really no excuse anymore. I did have fun doing the heroic on my Commando though. That genuinely still felt like a [Heroic 4], which is saying something in this day and age. 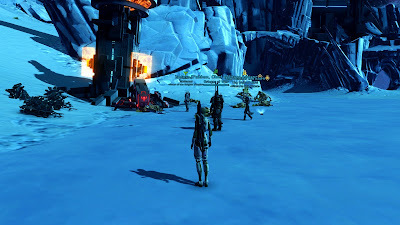 It has been a long time since Bioware added a proper new world event (and I'm hesitant to count Soovada), and it would be nice to see them add more, but frankly even the existing events could do with some love at this point. Bounty Contract Week is fine as it is in my opinion, but the Gree event could do with a rethink of the Southern area and the PvP quests, and the Rakghoul event simply should have level sync like every other content in the game does now. Don't turn any of the events on all the time though. Finding a group for an event that's only up for a week once every couple of months is one thing, but I imagine that things would look a lot bleaker if the population interested in participating was spread out over the whole year. "Don't turn any of the events on all the time though." It doesn't make any difference to me. I barley participate in any of these events. I farmed the Gree Event twice for some Gray Helix Components, just to buy me some legacy-offhands. But i don't have the stamina to do much more than that. I would like to have all the decorations (Bounty Event too) multiple times, but i'm getting bored very fast, when i have to do the round more than once. Apart from that, i don't think anyone in my guild is very active in these events. One guy loves the Bounty Contract Week, but for me it is just loading screen after loading screen, shortly interrupted from looking angry at a npc (who will drop dead), followed with more loading screens to hand in the quest. No, thank you. I need something fresh and new. I really wish they would bring back the Chevin Grand Acquisitions Race. It had a ton of content with full voice work and some really fun quests. It was up for a week in 2012 and has never come back. There was a bit of a kerfluffle at the time because the it offered good gear rewards for only one or two class specs and nothing but cosmetics for everyone else. However, the stats on that gear are so feeble compared to modern gear that no-one but roleplayers would use it now anyway. I've long been baffled that a bit of content that so many resources went into hasn't ever been reused. Hm, that doesn't match my recollection of that event at all. In fact, some of my main criticisms of the event in my review back in the day were centred on a lack of things to do and a lack of voice work. It's funny how different our recollections are! "I played through the first part of the event last night on the one 50 character I have. It's actually well designed fun content that seems to have been a lot of work to put together (full voice work, tons of side quests). Making Bioware's decision to pull it, ostensibly forever, after a week all the more baffling." Surprisingly enough, I participated in the Bounty Hunter Event for the first time in ages. Not sure why I wanted to, but I figured why not.